The Society of Aviation and Flight Educators (SAFE) has announced that the first in a series of high-definition videos of its Pilot Training Reform Symposium is now available for online viewing. 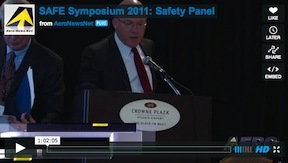 Produced by the symposium’s official media partner, Aero-News Network, the Safety Panel has successfully been uploaded. In time, the entire symposium will be available for viewing. The symposium proceedings were recorded using two HD cameras. Even with a high-speed Internet connection, the massive 62-minute Safety Panel video file alone required the better part of a day to upload. Additional segments are currently being uploaded and will populate a unique 2011 SAFE Symposium channel created on Vimeo.com. Viewers can select a number of options as well, including full screen, like, embed, and share. Other post-symposium information is being posted to the training reform website as it becomes available. Moreover, the symposium committee is in the process of generating a preliminary report that will soon be publicly released. Can Fatal Accidents be Reduced? AvFlash News: Training Reform, What’s It Gonna Take? Podcast: Are Flight Instructors the Root of GA’s Problems?